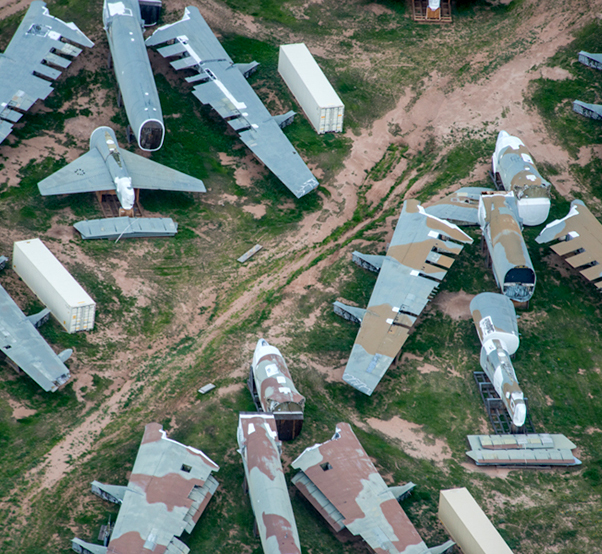 Several dismantled B-52 Stratofortress bombers lay in the Arizona sun at the 309th Aerospace Maintenance and Regeneration Group’s Aircraft and Missile Storage and Maintenance Facility on Davis-Monthan AFB, Ariz. A total of 365 B-52s were flown to the AMARG in the early 1990s and cut into five pieces each, in accordance with the Strategic Arms Reduction Treaty. Under the Air Force Civilian Intern Program, interns are hired for a two- or three-year program of on-the-job training, professional and personal development, and service opportunities at the Air Force Nuclear Weapons Center. “Our goal was to help our multi-discipline interns make connections between the program names and acquisition terms they use every day with the real nuclear-capable aircraft and missiles in full size,” said Jeff Sorensen, AFNWC deputy director of contracting. Last month, 11 AFNWC interns and other members toured the 309th Aerospace Maintenance and Regeneration Group at Davis-Monthan AFB, Ariz. The one-of-a-kind facility in Tucson stores more than 3,200 aircraft and aerospace vehicles owned by the Air Force, Navy, Marines, Army, Coast Guard and other government agencies, including NASA. 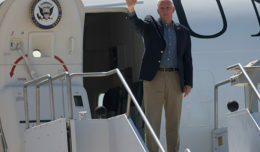 In addition, the group visited the nearby Pima Air and Space Museum, which has nearly 360 aircraft on its campus of 127 acres. At the museum, interns were able to put their hands on an early version of a B-61 nuclear gravity bomb, which is still under contract at the center today. The Pima museum also offers tours of Air Force Materiel Command’s 2,600-acre AMARG facility. “At AMARG, we saw acres of chopped B-52 bombers,” Sorensen said. In the early 1990s, 365 B-52 Stratofortress bombers were sent to AMARG and dismantled into five pieces each, in accordance with the Strategic Arms Reduction Treaty. AMARG’s current inventory of 95 B-52G and 13 B-52H-model aircraft is a resource for parts supporting the fleet. Several AFNWC experts manage contracts and programs related to the B-52s still in service and the nuclear weapons the aircraft can deliver worldwide, as well as contracts and programs related to ICBMs. Col. Randy Rivera, AFNWC director of contracting, offers encouragement to Margaret Doornbos, a contracting intern, in the missile crew commander’s chair as she turns the key for a simulated ICBM launch. Rivera led a group of AFNWC interns through the decommissioned ICBM launch control center at the Titan Missile Museum near Tucson, Ariz., in February 2019. To learn more about ICBMs, the group also visited the Titan Missile Museum. A National Historic Landmark, it is a fully preserved Titan II ICBM silo complex in Green Valley, south of Tucson. 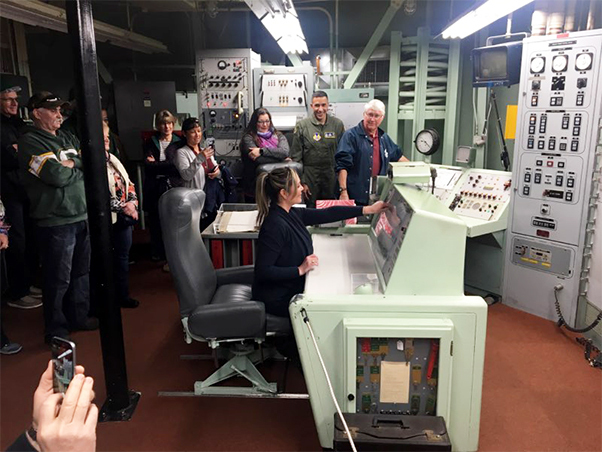 “At the missile museum, we entered a decommissioned ICBM launch control center and a launch facility with its denuclearized missile still in place, as if on alert,” Sorensen said. 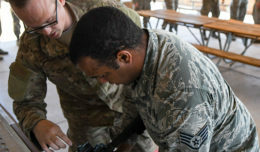 Headquartered at Kirtland AFB, AFNWC is responsible for synchronizing all aspects of nuclear materiel management on behalf of Air Force Materiel Command, in direct support of Air Force Global Strike Command. The center has about 1,300 personnel, both military and civilian, assigned to 18 locations worldwide. 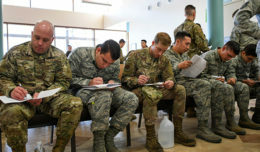 More on the Air Force Civilian Intern Program can be found at www.afciviliancareers.com.